For my MSc. 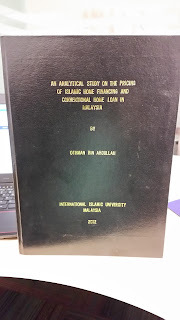 in Islamic Banking and Finance thesis, I decided to research on the pricing of Islamic Home Financing and compare it with conventional home loan. The motivation was to verify my belief that being an Islamic banking product does not make it cheaper or expensive although there were claims made that Islamic financing are more expensive than conventional loan. Below is an excerpt from my Thesis abstract.
" This research paper attempts to analytically study the pricing of Islamic home financing versus conventional home loan to examine the competitiveness of the pricing of conventional home loan and Islamic home financing. Specifically, this research will identify the components of loan and financing prices, the formula used in calculating the various price components and the factors that affect the price calculations. This research will also gather available pricing related data and finally make comparisons of the various pricing components of conventional home loan and Islamic home financing. The finding of this research shows that the pricing formula for conventional loan and Islamic financing are the same. If all factors affecting pricing calculation are the same, the price of a conventional home loan and Islamic will be exactly the same. What makes a loan or a financing more expensive than the other is the product feature and other terms and conditions imposed by the loan or financing providers. There was some truth that product feature wise, Islamic BBA home financing appeared to be more expensive in the past. Now that Islamic banking products have evolved, the pricing of floating rates BBA and MM financing have become very competitive with conventional home loan products. "